This Fishing Kit from Lanaak arrives with all the gear you need to equip a family fishing expedition. Add it to your shopping cart, and you'll be ready to head out fishing this weekend! This combo set includes a light-action and durable telescoping rod that collapses to 17" and expands to 65". It is ideal for camping, hiking and travel. The closed-face, spincast reel arrives pre-spooled with 200 feet of 8-lb test line and features a push button casting system that makes casting easy for beginners and old-timers alike. Because you can't catch fish without bait, we include a hand net to provide an endless supply of minnows and nonstop entertainment (even if the fishing aren't biting). The kit also includes a tackle box stocked with hooks, bobbers, sinkers, plastic worms and a crankbait lure. We want your family fishing outing to be fun, not frustrating, so we include the Lanaak Fishing Starter Guide with clear explanations for basic fishing skills, simple diagrams for rigging options, and a few tips and tricks for fishing with a family. This kit makes a great first fishing pole, but the 65" rod is suitable for anyone seeking a portable, travel-ready fishing setup. Everything stores neatly in the zippered carry bag which fits in a backpack or under a car seat. Customer Satisfaction is our top priority We offer a 30 Day Money Back Guarantee. In the unlikely event that our product does not meet your expectations, contact us for a replacement or return it for a full refund. Gear up for life-long memories of family fishing adventures! Add the Lanaak Fishing Kit to your cart today. 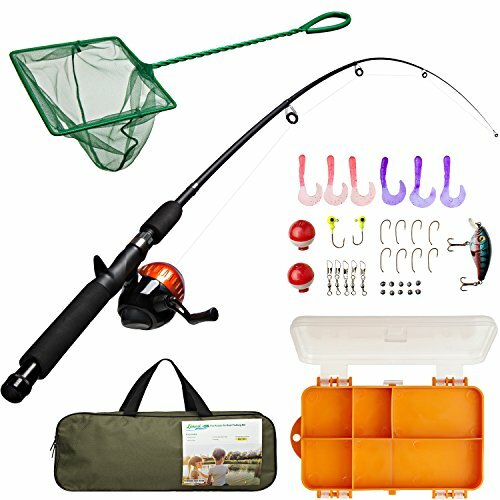 37 PIECE FISHING GEAR SET includes: 65 inch telescopic fishing pole; spincast reel; tackle box stocked with gear; minnow net; beginner's guide; and carry case to hold it all. EASY TO CAST reel reduces tangles with the push-button design. Reel arrives pre-spooled, no assembly needed. LOADED TACKLE BOX comes with everything needed to start fishing. Includes 2 floating bobbers; 10 hooks; 10 split sinkers; 10 swivels; 2 jig heads; 6 plastic worms; and 1 crankbait lure. CATCH YOUR OWN BAIT with the included net. Skip the bait shop and have fun chasing down minnows and crickets. Never buy bait and never get bored! CARRY BAG for compact storage and protection. This whole kit fits under a car seat or in a backpack. Gear up for an adventure and add to your cart today! If you have any questions about this product by Lanaak, contact us by completing and submitting the form below. If you are looking for a specif part number, please include it with your message.